The Brook Lamprey Lampetra planeri is a non-parasitic freshwater lamprey that undertakes only localised migrations. It is the smallest of the three species occurring in Ireland and is normally up to 15 cm long. Identification between the ammocoetes of River Lamprey and Brook Lamprey is difficult, except when nearing metamorphosis; however, the adults can easily be distinguished by size and the absence of developed teeth in Brook Lamprey. The brook lamprey is the most abundant and widespread of the lampreys of the British Isles, and still present in many areas throughout Northern Europe where other lamprey species have gone extinct. 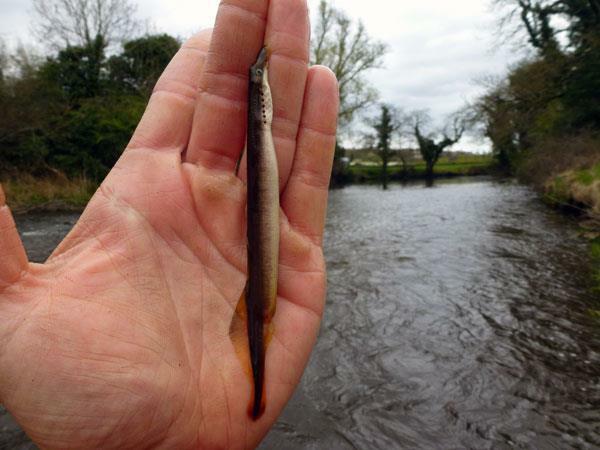 Brook Lamprey spawn in shallow flowing water during March-May when water temperatures are over 10-11°C. 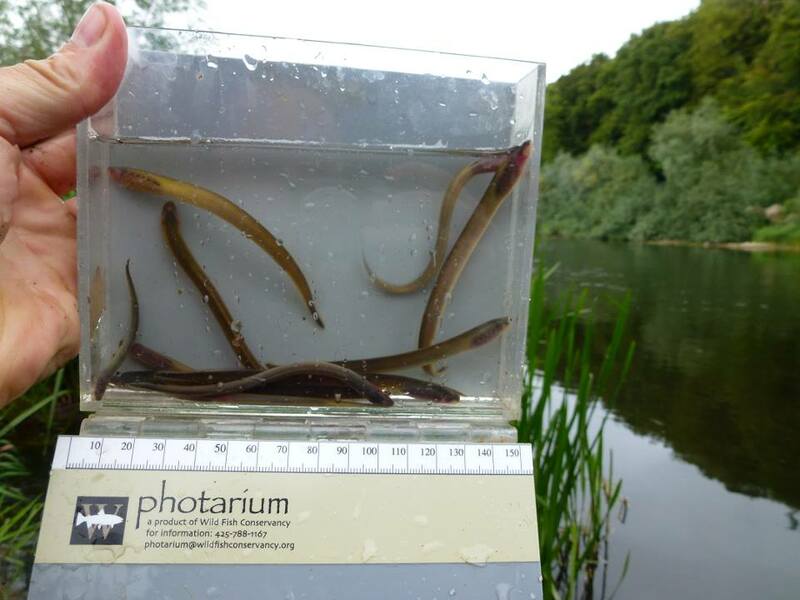 Typical Brook Lamprey spawning requirements include water depths of 3-30cm and current velocities between 0.2m s-1 and 0.3m s-1. The spawning nest is constructed on a sand or shallow gravel with average particle size of the substrate used by the brook lamprey less than 0.5cm. The nest of the brook lamprey is an oval depressions 20×15 cm in width and 5-10 cm deep. Brook lampreys are communal spawners usually nesting in groups of 2-10 but occasionally as many as 30 have been recorded using the same nest. Brook Lampreys are characteristically known to spawn at the lower ends of pools and sometimes favour shaded spawning sites, such as under bridges. The spawning ritual is similar to that of the other two species but due to the smaller size of the brook lamprey, females can be less fecund. Spawning activity may last over one week and Brook Lamprey adults die within one month of spawning. Once hatched Brook Lamprey larvae leave the nest at 3-5mm in length and drift downstream, settling in depositing substrates such as silt at river margins and back-waters. The ammocoetes are semi-translucent and are grey-brown in colour however can appear in a golden form with a very much reduced pigment. Brook Lamprey ammocoetes unlike the other two species have light-sensitive cells in the skin and are negatively phototactic, remaining sedentary in their burrows for the most part of their larval cycle. The Brook Lamprey larval period lasts for approximately 6 years. Following metamorphosis Brook Lamprey transformers turn more silvery along the sides and the belly and the back remains a dark grey-brown colour. At this stage of the life cycle the brook lamprey has reached a length of 12-15cm. The adult brook lamprey moves out from the silt beds as spawning time approaches and start to migrate upstream in search of a suitable habitat for spawning. They continue to burrow as adults or hide under stones during the day. Brook Lamprey larvae are active filter feeders, feeding on detritus similar to both Seam and River Lamprey species; however, the adult Brook Lamprey does not feed. See this post also which includes videos and photos of brook lampreys spawning.